Ciliopathies are complex disorders caused by genetic mutations which result in defective or dysfunctional cilia in many organs of the human body. Alström Syndrome is a very rare recessively inherited condition which affects the metabolism of many major organs, particularly the heart, lungs, kidneys and liver. Because the condition unfolds gradually from birth and the different manifestations vary from individual to individual, correct diagnosis is often delayed leading to suboptimal treatment and a failure to anticipate future developments. There are presently just over 700 cases known world wide and approximately 50 in the UK although the history of poor diagnosis referred to above almost certainly hides many more. How is Alström Syndrome diagnosed? Dilated cardiomyopathy is often detected in young babies and often leads to premature death. Kidney failure may also occur. During childhood, patients suffer deteriorating eyesight which may include nystagmus and photophobia which often leads to blindness. Hearing loss and Type 2 diabetes is also common. Bardet-Biedl Syndrome (BBS) is a rare, recessively inherited complex disorder that involves many body systems. Mutations in more than 20 different genes encoding proteins involved in cilia formation, maintenance and signalling can cause BBS. Genetic screening is a major part of the diagnostic pathway. The incidence is estimated at 1 in 100,000 births. Jeune Syndrome is a very rare (estimated incidence of 1 per 200,000), recessively inherited ciliary disorder from the short-rib polydactyly syndrome spectrum. It affects mainly the skeletal system, but can be accompanied by symptoms in other organ systems e.g. early renal failure. Mutations in several genes encoding ciliary transport molecules have been found to cause JATD. Variable degree or narrow/ small thorax due to short ribs resulting in lung hypoplasia in utero. Respiratory distress at birth and in infancy which improves later in life due to postnatal rib growth. Short arms and legs and shortening of the fingers (brachydactyly) may be present. Cone shaped epiphyses (ends of the bones) often become visible in x-ray images of the hands after the first year of life. More rare disease features are extra fingers and toes (polydactyly), as well as retinal disease such as retinitis pigmentosa and rod-cone dystrophy leading to impaired vision and progression to blindness, mainly associated with mutations in certain genes such as IFT140so far. Rarely clinically manifest retinal disease such as retinitis pigmentosa and rod-cone dystrophy leading to impaired vision and progression to blindness, mainly associated with mutations in certain genes such as IFT140 so far. Renal disease due to polycystic or nephronophthisis-like kidney symptoms which may progress into renal insufficiency, mainly associated with mutations in certain genes such as IFT140 so far. Mild liver dysfunction is often reported which only rarely seems to progress into more severe liver disease. Neurological symptoms are usually not observed. Lethality occurs in 20-60% of all cases, mainly during the first 1-2 years of life. This is most often due to respiratory problems resulting from a narrow ribcage. Some patients seem to "grow out" of the rib phenotype later in life. Nevertheless, the narrow ribcage can cause mechanical lung compression during pregnancy in female patients. Patients also might more frequently develop scoliosis and hip dysplasia. There is no causative therapy available for JATD to date, therapeutic options are limited to supportive measures such as mechanical ventilation or thoracic expansion surgery in severe cases and appropriate treatment of respiratory infections. Renal disease should be diagnosed early and patients should receive appropriate supportive treatment such as dialysis and renal transplantation. Retinal disease should be excluded and/or monitored via regular ERG (electroretinogram) examinations. Extra fingers and toes can be removed surgically if they cause functional problems. Joubert Syndrome is a rare developmental disorder affecting mainly the brain but this might be accompanied by renal and/or retinal symptoms. Mutations in several genes associated with cilia can cause Joubert Syndrome which are inherited often in a autosomal-recessive manner but x-chromosomal-recessive inheritance also occurs. Abnormalities of the brain, mainly the cerebellum-part lead to low muscle tone at birth, developmental delay and there may also be breathing abnormalities and movement disorders. Brain scans such as magnetic resonance tomography (MRI) show a characteristic feature of the disease, named the “molar tooth sign”. Renal disease, usually in the form of Nephronophthisis, may also occur and can lead to renal insufficiency. Retinal degeneration is observed in some patients (often in combination with kidney disease). This can present initially as night blindness, progressing into visual loss also in daylight and blindness. Extra fingers and toes (Polydactyly) are sometimes observed. There is a broad phenotypic spectrum of the brain phenotype among patients ranging from developmental delay and slight movement problems to severe brain defects including open brain that might be incompatible with life. Breathing problems are due to cerebral mis-regulation rather than to primary problems in the respiratory tract and these can lead to death. No cure is currently available for Joubert Syndrome, only supportive therapy. Nephronophthisis (NPHP) is the most common genetic cause of chronic kidney disease within the first three decades of life. Presentation may occur during infancy but more typically in late childhood with progressive renal failure manifesting during early puberty. Ultrasonographic features demonstrate normal size kidneys with loss of cortico-medullary differentiation and increased echogenicity. Histologically, NPHP kidneys are characterized by the presence of cortico-medullary cysts, tubular basement membrane disruption and tubulointerstitial nephropathy. Inherited in an autosomal recessive mode, NPHP is genetically heterogeneous with at least 17 genes currently implicated which account for only about 30% of cases. NPHP is a ciliopathy disorder because similarly to the proteins involved in polycystic kidney disease, the nephrocystins (NPHP associated proteins) have all been localized to primary cilia, basal bodies and centrosomes. Many different ciliopathy patients show symptoms of NPHP. NPHP may also have extrarenal manifestations, such as liver fibrosis, situs inversus, or cardiac malformations. 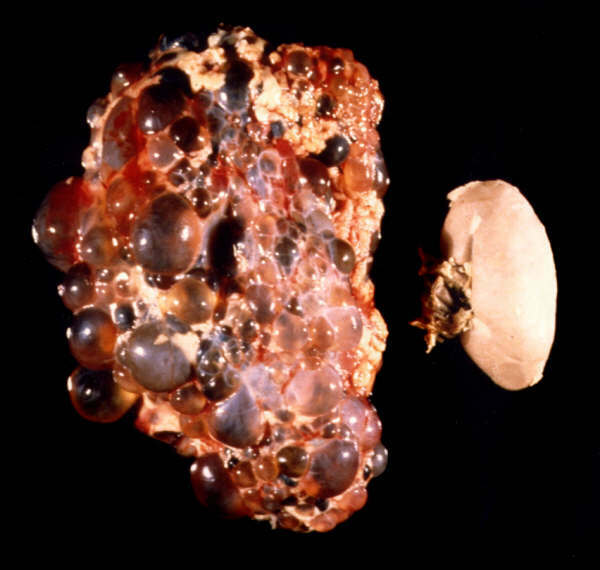 Polycystic Kidney Disease (PKD) refers to a range of genetic diseases which are a common cause of kidney failure in children and adults. Primary Ciliary Dyskinesia (PCD) is the only known disorder of the motile cilia. However, dysfunction of motile cilia is implicated in several primary cilia ciliopathies - but these links are not yet well established. PCD is an autosomal recessive disorder which presents with upper and lower respiratory tract infection, and affects the lungs, sinuses and ears. Other features of PCD reflect dysfunction of cilia motility outside the airways, including subfertility, hydrocephalus and body laterality (left-right axis) defects. Some rare cases have retinal and neurological problems. The incidence is 1 in 10,000-15,000. However, the incidence can be as high as 1 in 2,500 in the Asian population and other areas where consanguineous marriages are prevalent. Recent studies have begun to locate PCD genes scattered throughout the genome, making it a heterogeneous condition. More than 30 different genes have been found to cause PCD, either with recessive inheritance and more rare X-linked-recessive inheritance. If PCD is not diagnosed, there is a risk of permanent lung damage. Hearing and fertility problems are common. PCD arises from cilia dysmotility associated with cilia structural defects or lack of cilia, that can usually be detected using specialised microscopy. Screening tests for PCD include nasal nitric oxide and tests of ciliary motility by high speed video imaging of nasal cells, or less advanced in vivo tests including the saccharin test. Specific diagnosis requires examination of cilia by light and electron microscopy, with epithelial culture in doubtful cases. Genetic testing is increasingly used to assist PCD diagnosis especially since up to a fifth of cases may not show any obvious structural cilia defects. Retinitis pigmentosa (RP) is the name given to a large group of inherited diseases of the retina that all lead to a gradual progressive loss of vision (Inherited Retinal Dystrophies). The terms encompasses many named conditions. Difficulties with night vision and peripheral vision are usually the first things that are noticed. Later, detailed and colour vision are affected. The age at which symptoms start is variable and the rate of deterioration may vary but typically night blindness and loss of peripheral vision is followed by tunnel vision. Ultimately this window on the world may shrink and close up altogether. RP is caused by flaws in any of approximately 200 genes, many of which remain to be identified. Though research is progressing it is currently incurable. Several forms of RP are understood to be ciliopathies. Variable patterns and rates of retinal degeneration (sight loss). Syndromic forms of RP involve other disabilities or difficulties. Affects all ages, races and both sexes. A major cause of sight loss in people of working age and children. Progressive sight loss of variable degree, pattern and rate. There is no therapy available for RP to date. Practical assistance and lifestyle changes are necessary to cope with reduced vision or blindness. Significant emotional impacts in RP families, especially where there are multiple generations of people affected. Usher syndrome is an autosomal recessive genetic or inherited condition that affects hearing, vision and balance. There are three clinical types of Usher syndrome, Usher one, Usher two and Usher three. In the UK, Usher one and Usher two are the most common. However, we are finding increasing numbers of people with Usher who have experienced a progressive hearing loss from childhood. These people may have Usher type three. People with Usher type one are profoundly deaf from birth and have balance problems. Most use sign language as their primary means of communication. The hearing loss often remains stable throughout a person's life and is generally not helped by hearing aids. However, recently children with Usher one are benefiting from cochlear implants, thereby allowing them to develop speech. Most children with Usher type one usually begin to develop retinitis pigmentosa-related vision problems between the ages of 8-12 years old, with vision problems first noticed at night, followed by increasing difficulty with side (peripheral) vision. Visual problems will progress. The balance problems mean that children may be late in sitting up and walking. Children with Usher two are born with moderate to severe hearing impairment and normal balance. The severity of hearing impairment varies, but many, if not most, children can benefit from hearing aids. Children are likely to use speech to communicate. The visual problems related to retinitis pigmentosa (RP) tend to progress more slowly than in Usher one and also tend to begin later, usually in late teenage years, or may not even begin until the person is in their 30s or 40s. The RP is variable from person to person, so it is impossible to predict how much sight and hearing someone might have at any given stage in life. The person with Usher two is faced with continually adapting to two changing senses and the impact a change in one sense has on their ability to use the other. Children born with Usher three have normal hearing. Hearing worsens over time and may progress to profound hearing loss. However, the rate at which hearing and sight are lost can vary between individuals, even within the same family. Children may develop noticeable hearing problems by their teens and usually are using hearing aids by mid to late adulthood. Vision problems usually begin during teenage years, starting with night blindness. The sight problems are more variable and this can mean the central vision is affected earlier. As with Usher two, the RP is variable from person to person, so it is impossible to predict how much sight and hearing someone might have at any given stage in life. Some people with Usher three will have near normal balance but some may develop problems later on. As with Usher two, the person with Usher three is faced with continually adapting to two changing senses. Usher three is rarer in the UK, so diagnosis is often delayed.